While the Volvo Ocean Race fleet prepared to start their ninth leg in Lorient, France, a RIB under the authority of the race organization was run over near the start line by the 40-meter maxi trimaran Spindrift 2, presumably in the area as a spectator to the race start. With four people onboard the RIB, the incident occurred Tuesday, June 16 around 4:15 pm in the starting area of Leg 9. A woman on the RIB received leg injuries in the collision, and after receiving attention on the water, she was airlifted at approximately 5:11 pm and transported to Scorff Hospital in Lorient were she was treated by medical staff at 5:16 pm. "Above all else, we are concerned about the condition of the injured person," said Yann Guichard, skipper of Spindrift 2. "All our thoughts go out to her and to her family. The team has been deeply affected by the accident and naturally we are cooperating fully with the investigation that is underway." From the photo, the weather hull of Spindrift 2 is seen passing over the RIB with its blades coming in contact with the boat and passengers. Race stopover officials from Lorient are in regular contact with her family, but have no further official updates on her condition. I find myself on a "press boats" with three other photographers and two pilots. The weather is beautiful, the working conditions are ideal. Before launching out to sea towards Gothenburg, the end point of the race in Sweden, the Volvo Race yachts must carry a small race course near Lorient. The "boat media" on which I find myself took position at the limit of the "exclusion zone" strictly limited by the organizers not to hinder competitors near the starting line. There are always many people on the water racing days. Several ships of the organization are there to prevent boaters and jet skis that swarm around the perimeter to venture into forbidden. I see the Spindrift 2 that goes to the starting line. Almost stopped, the boat turns to port and took it towards the taking off speed. He heads straight for the group organizing boats. Immediately, the maneuver seems dangerous. 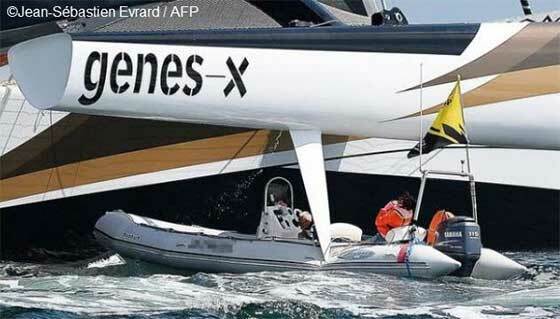 This trimaran is a real Formula 1 of the sea, with great sailing, unheard tremendous acceleration and inertia. The helmsman does not enjoy a good view. The Spindrift 2 is like a big ship and difficult to maneuver down the track to a semi-rigid boat organizers stopped. The boat driver knows that if he advances, his boat will pass under the hull of the trimaran. It seems paralyzed, like us, on board the press boat. The fatal scene lasts only three or four seconds. The shock is inevitable. I see occupants rigid throw overboard in panic. Life jackets inflate automatically on contact with water. One of the rudders Spindrift 2 hits with full force the strands of a semi-rigid boat by making a really scary noise, a kind of large "tac"
A woman is projected violently with water. I am the only photographer on board the press boat to have the reflex to rob my camera to the scene and take fifteen images continuously. Why? I do not know ... I have not had time to understand what happened. Immediately, our star rushes to the scene of this rare accident, thirty or forty meters from us. But we will not have to intervene: in seconds, two teams of the National Society Rescue are already there and take things in hand. A huge bloodstain slowly spreading in the sea near the canoe struck by the boat. After twenty minutes, a helicopter arrived and hoisted the victim, which looks very bad shape and was collected on board a boat of rescuers.